Propelled by the success of the sequencing of the human and many related genomes, molecular and cellular biology promise significant scientific breakthroughs in the near future. Mathematics (broadly defined) is positioned to play a major role in this effort, helping to discover the secrets of life by working collaboratively with bench biologists, chemists and physicists. The critical need, which has already begun, is the development of a quantitative body of theory for biology. This development of theory is expected to have the same impact on biology as it did on the sciences of physics, chemistry and engineering in the 20th century. This quantitative body of theory will be created by people with strong backgrounds in both biology and in the mathematical sciences. Because of its outstanding record of interdisciplinary research and training, the IMA is an ideal venue for this annual program at the interface between the mathematical sciences and biology. 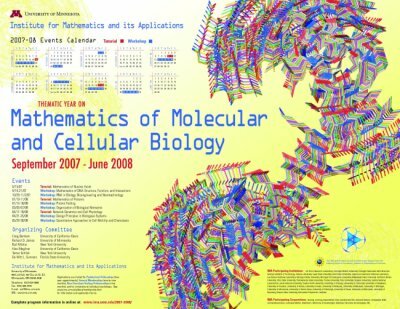 The interface between the mathematical sciences and biology has been growing steadily in importance in the last decade, but there is tremendous room for progress. Major advances are needed in mathematical, statistical and computational methods to generate significant impact on the prediction and control of spatio-temporal molecular and cellular behavior. This IMA program starts with nucleic acids, moves on to proteins, and ends with the modeling of cellular physiology. These areas have major interconnectedness, and the program will emphasize these relationships. In the Fall quarter we begin with nucleic acid (DNA and RNA) organization, structure, function, and the interaction between DNA and RNA in the production of proteins and the orchestration of cellular metabolism. In the Winter quarter we study protein structure and function. The new science of proteomics aims to understand how proteins are produced and how they function and malfunction. We need to understand how protein production is controlled, and the cascade of interaction among families of proteins. In the Spring quarter we study the mathematics of cellular physiology, a highly complex biological system, with structures from molecular to macroscopic scale, and processes with critical time scales from nanoseconds to hours. Modeling cellular behavior poses significant challenges to the mathematical sciences. Progress at the interface will be enabled by developments in mathematics focused on biology at the molecular level. Accurate models of molecular forces appropriate to biological systems will be critically needed. These will have to work well even when (as during protein folding), molecules form, break and remake bonds, a far more difficult and nonlinear situation than found in crystalline substances. New and efficient methods will be needed to model the effect of solvents on important biological reactions. Purely stochastic methods are expected to be important, but, equally importantly, a theory will have to be built that supplies biologically meaningful probability distributions that are input to those methods. In addition, the mathematical models must be amenable to efficient computational algorithms that can analyze realistic biological reactions. Molecular dynamics is a critical part of almost every quantitative study at the molecular level, and the time scales treatable by accurate MD methods, based on truly accurate molecular forces, are far too short to treat anything but the most simple biological reaction. At a higher but still relatively simple levels, there are simple organized structures in biology, e.g., such things as microtubules, mini-chromosomes, actin filaments, protein motors, viral capsids, membranes, that may be amenable to mesoscale (bridging the gap between microscopic and macroscopic) and macroscopic mathematical models. As emphasized by members of the Biological Advisory Committee it will be important to focus on sufficiently simple (but real) biological systems to maximize the value of the quantitative approach.